Shirley Degenhardt of Treasures on the Korner in Norwalk, Wisconsin. 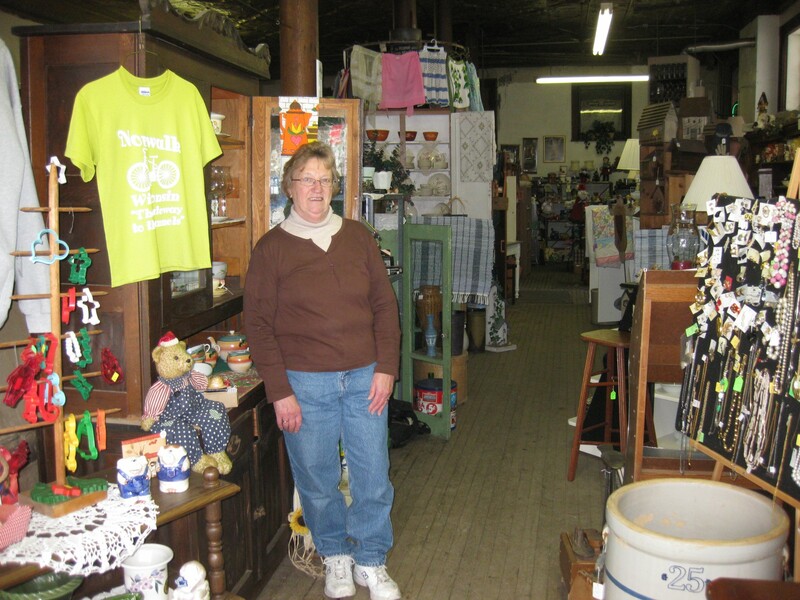 “Treasures on the Korner is the name”, said Shirley Degenhardt, who opened her new business on the corner of Norwalk, Wisconsin’s Main Street in the summer of 2007. Since that time she has filled two buildings with antiques- the old, the used, the elegant, the out-of-date with some new and up-to-date treasures as well. The building which houses Treasures on the Korner dates back to 1903 and at one time was the home of Otto Scheule’s Norwalk Hardware Store. You will be able to wander through a high ceiling room supported by the five original round, brown pillars with the original hardwood floors. The original ceiling is pressed tin with an elaborate floral design. The cupboards along the wall have been there 100 years. You will notice small holes in the floor bored for rope which was stored in the basement and customers could view the size rope available and then pull the length needed and purchase. Prior to Treasures on the Korner, the building was home to Degenhardt’s Tire, a wholesale, retail and on the farm service tire store operated and owned by Shirley’s husband, Reuben. The treasures are obtained from auctions and items collected over the years as well as 12 dealers who supply inventory. A partial listing of items available are dish and tea sets, plates, tea cups, furniture, cookie jars, clear and colored glassware, old tools, old toys, pottery, crocks, and silverware. Some of the new items are handcrafted wooden birdhouses, warm fleece and quilted quilts, coffee tables and end tables. If driving through Norwalk look for a decorated chair on the corner. If you see the small, cute antique chair, it is to tell you that Treasures on the Korner is open for your antiquing delight! Now would be a great time to plan your summer get-away and enjoy the Elroy-Sparta Bike Trail, take in some antique hunting at Treasures on the Korner and enjoy a relaxing weekend at Amil’s Inn Bed and Breakfast.